The Feast of the Fairway Golf tournament is all about having fun while building awareness for cancer and fundraising for the Canadian Cancer Society. Unfortunately, almost every 1 in 2 Canadians will be diagnosed with cancer in their lifetime. This golf tournament was started in the memory of the late Stuart Budd, co-founder of Budd Automotive Group who passed away from cancer. Every year for the past 12 years, this tournament is organized to bring the golf and automotive worlds together for a special cause. Here is a recap of what happened this year! On August 24, 2018, Land Rover fans and Budds’ supporters got together for the funnest event of the year. Glen Abbey Golf Course is the perfect spot for the perfect golf tournament. This year, there was no shortage of food, fun and amazing vehicles. 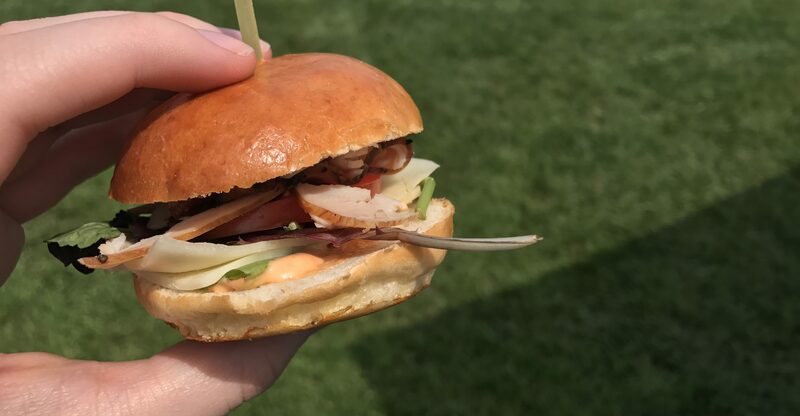 Food from different restaurants included sushi, turkey sliders, barbecued stiploin beef sliders, homemade BBQ chips, fresh oysters and grilled cheese sandwiches were prepared for the guests. The Feast of the Fairways allowed participants to relax, have fun and not have to worry about scores. And Land Rover did not miss the opportunity to introduce their brand-new hybrid 2019 Range Rover PHEV to the guests! There was a lot more waiting for the participants after the golf tournament. A silent and live auction was followed by some dancing and live music. And that wasn’t all, there was also a 5-course feast prepared by the Glen Abbey Executive chef. So you can imagine, the participants were happy full by the end of the day! This year, the Feast of the Fairways tournament helped raise almost $35,000 for the Oakville Branch of the Canadian Cancer Society. We would like to thank all the participants who played a vital role in fighting cancer across Canada. The money raised will be used in research efforts to help find a cure for cancer and promote a healthier way of living.